I began with the background using a waterwash watercolor technique. In a small dish I put a drop of the new Balmy Blue ink, a little water and I squeezed a couple drops of the Wink of Stella in the mix! Using the Aqua Painter … I brushed a little water onto my cardstock and then I picked up some “color” from my mixture and brushed it onto the cardstock. Not a project I could do in a class because it was pretty wet and took a while to drive however I also could have used the Watercolor paper!! lol I do however love the shimmer from the Wink of Stella. Once dry I simply stamped the images onto the cardstock using my StazOn. 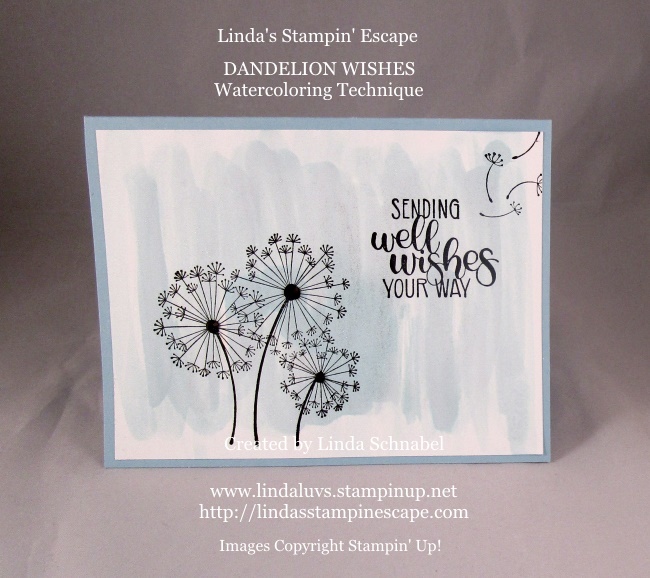 I finished off my card with the new Faceted Dot by placing them in the center of my dandelions – so nice to have all the new embellishments! 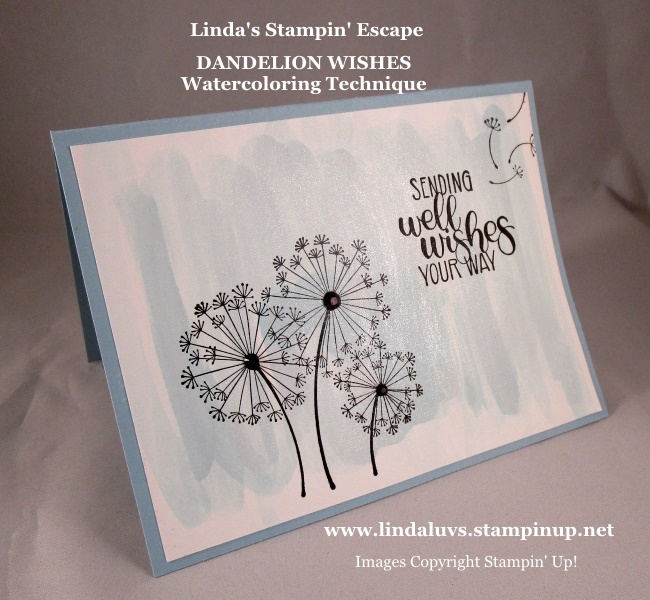 It is a simple layout but I love these stamps and the font on the greetings … so pretty!! So many possibilities with this stamp set! Hope you enjoyed this one. Have yourself a great Monday. I visited Darlene in rehabilitation due to her back pain, met her at church, then moved to Iowa to be near family. She asked if we could be pen pals. Ive been sending a card, Ive never been a pen pal. Asked where I can help her find pretty stationery & matching envelopes. She is a joy. Thankyou Linda. You may call my cell 727/212-3710 or send a message.